Mayaterials was founded in January 2003 to commercialize two technologies licensed from the Laine group in Materials Science and Engineering at the University of Michigan (UM). One technology uses novel silsesquioxane (SQ) [nanosilica] chemistries to produce organic/inorganic nanocomposites especially unique coating systems. The second technology allows direct production of SQs from agricultural byproducts especially rice hull ash (RHA). RHA is produced in the U.S. in 100,000 ton/yr quantities and is a often a waste product. 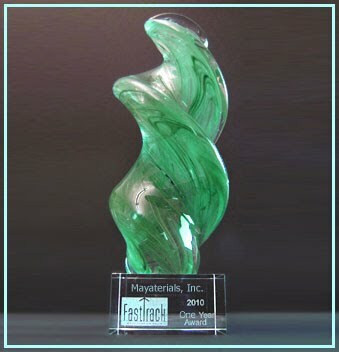 Mayaterials' scientists have created multiple families of novel, green and cost-effective SQ coating systems for multiple applications including corrosion resistance, nanoimprint lithography, and transparent refractive index controlled coatings etc. In particular, we have developed SQ systems that serve as very effective semi-permanent mold release agents for the injection molding industry. They are designed to improve productivity by significantly reducing sticking problems, cycle times, scrap and mold maintenance while improving parts quality in plastic and rubber molding applications. Mayaterials Inc. is a green technology company with the majority of our products derived from agricultural and biofuels waste　products. The same technologies allow us to recycle the majority of our products providing near zero waste products. In November 2015, Mayaterials won a NSF Small Business Innovation Research Phase I Award “Production of alkoxysilanes directly from biogenic silica” (Award ID: 1548882). This NSF project started on January 1, 2016 and offers the chance to successfully depolymerize silica at low temperatures using a sustainable, natural resource as the starting material. Currently, all silicon used in solar cells and computer chips, and all silicon used in the manufacture of silicon containing chemicals including silicone rubbers, oils, lubricants and fumed silica (paints, paper) etc. is produced in an energy, equipment and CO2-intensive process. Biogenic silica includes diatomaceous earth and many kinds of agricultural waste including rice hull ash, inorganic waste from bioethanol production, corn stover, and wheat chaff. The objectives of this project are to develop economical routes from these silica sources to high purity, high value silica products at significantly lower cost than currently available by using a green and sustainable technology. Key markets include electronic, optical, and photonic applications, specialty chemicals, and consumer products.